In 2009, as part of our Inn Turns 10! birthday celebration for our Bed & Breakfast near Black Mountain, NC, we’ve pledged to assist 10 business owners in the developing world — with microloans through Kiva — to help their businesses succeed, thereby improving their local economies and communities and giving them the means to raise themselves out of poverty. Our seventh Kiva loan for 2009 is currently helping Yao Ganyo (pictured above), a young married father of four who lives in the western African country of Togo. Yao opened up a cafeteria restaurant and he serves breakfast, so as Bed & Breakfast innkeepers, we feel a little bit of kinship with him. Yao’s cafeteria restaurant supports his young family and he requested a loan through Kiva to invest in restocking and buying condiments and the like. 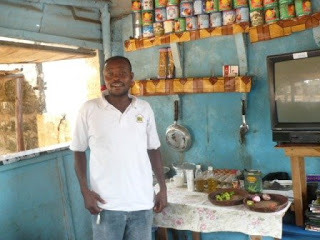 We, along with 20 others who registered as Kiva lenders, supplied Yao with a microloan to help his business succeed. (One thing we like to do is see where all the lenders on our loans are from — Yao’s lenders are from the U.S., UK, Korea and Germany.) We wish Yao much success with his cafeteria restaurant! Stay tuned as we have three more entrepreneurs to help out this year. You can read about our other loans at our Inn Turns 10! page. I was a Peace Corps Volunteer in Togo. It's wonderful what you are doing. I think small loans for businesses is a great investment in a country like Togo. Kiva seems like a great development tool.